Happy Launchiversary! It's been two years since World IPv6 Launch in 2012, the day many major Internet Service Providers (ISPs), home networking equipment manufacturers, and web companies around the world started permanently enabling IPv6 for their products and services. What is remarkable is that this is the fourth straight year that IPv6 use on the global Internet has doubled! Even more, in some cases we are seeing dramatic increases in IPv6 usage, such as the recent measurement of Verizon Wireless' network having over 50% IPv6 deployment! We are now well beyond the "IF we ever deploy IPv6" phase of even a few years ago. All this week over at the Internet Society we have been celebrating the Launchiversary with blog posts, social media activities, and a great amount of new deployment content. The World IPv6 Launch site includes a new IPv6 infographic that explains the progress we've made over the last two years and a blog post observing how v6 has grown measurably in the last two year. Our Internet Technology Matters blog has a few posts covering where we started, where we are now, and where we're going. Slides: IPv6 and Telecom — IPv4 Is FInally Running Out. Now What? 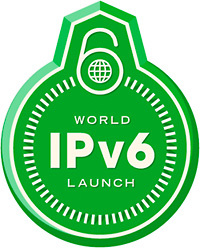 I encourage all of you to (a) follow along with the World IPv6 Launch, Internet Technology Matters, and Deploy360 blogs and social media properties, and (b) share the information with your own circles. If you are a network operator, you can also still join World IPv6 Launch and participate in the IPv6 measurements program! And… if you can you do one thing today to help with IPv6 deployment, PLEASE ASK YOUR ISP WHAT THEIR PLAN IS FOR IPv6 if they do not already offer it! And if your ISP does offer IPv6 but you haven't yet made the transition with your network, please check out our "Start Here" pages to explore how you can get started with deploying IPv6. Thanks, and Happy Launchiversary — may we see even more IPv6 deployment growth between now and the third Launchiversary next year! Local Time: Wednesday, April 24, 2019 01:17 PM PDT – Page Load: 0.2551 Sec.